Heavy rain in south west China's Sichuan province causes severe flooding in some areas, with bridges washed away and a landslide reported. 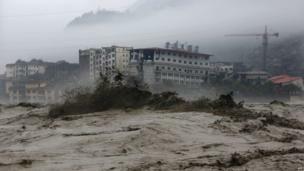 Heavy rain in south west China's Sichuan province has caused severe flooding in some areas, including places such as Beichuan that were hit by the 2008 earthquake. 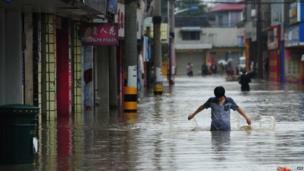 The rain, which has been going on for days, has flooded many parts of the province, including the provincial capital Chengdu. 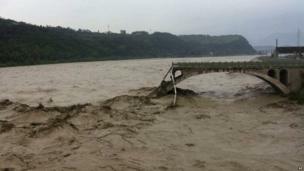 On Tuesday, the Qinglian bridge in Jiangyou city was washed away, with at least 12 people reported missing. On Wednesday, up to 40 people were reported buried in a landslide elsewhere in the province. 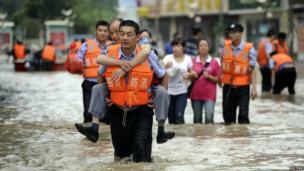 Transport in flood-hit parts of Sichuan and neighbouring Yunnan province has been paralysed, state media say. 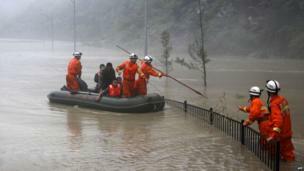 Thousands of rescue workers have been working to bring stranded residents to safety. 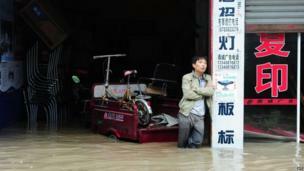 The flooding in Sichuan has affected 360,000 people and damaged hundreds of homes, state media say.